Spicy, crispy and stomach-filling snack. Mixture of crushed gathiya & spices. Made from roasted moong beans & spiced perfectly spices. It has shelf life of 30 days. Pethawala Agra is a well-reputed manufacturer & trader of Agra's Petha, Indian Sweets (Desi Ghee), Gajak, Chocolates, Gifts, Rewadi, Dalmoth, Namkeen, Snacks, Tasty Pickles, and many other exotic and lip-smacking products. www.pethawalaagra.com is the place where you can buy all the above mentioned products at optimum prices with faster home delivery. At Pethawala Agra, we strive to achieve the high degree of customer satisfaction. We believe that CUSTOMER SATISFACTION IS THE EFFECTIVE KEY TO QUALITY ASSURANCE. Quality is defined not only in terms of taste and look of the product but also providing our respective consumers, products with minimal cost and best and effective home delivery. Therefore Pethawala Agra is the Petha seller & exporter in Agra.Pethawala Agra is a well-reputed manufacturer & trader of Agra's Petha, Indian Sweets (Desi Ghee), Gajak, Chocolates, Gifts, Rewadi, Dalmoth, Namkeen, Snacks, Tasty Pickles, and many other exotic and lip-smacking products. www.pethawalaagra.com is the place where you can buy all the above mentioned products at optimum prices with faster home delivery. At Pethawala Agra, we strive to achieve the high degree of customer satisfaction. We believe that CUSTOMER SATISFACTION IS THE EFFECTIVE KEY TO QUALITY ASSURANCE. Quality is defined not only in terms of taste and look of the product but also providing our respective consumers, products with minimal cost and best and effective home delivery. Therefore Pethawala Agra is the Petha seller & exporter in Agra. 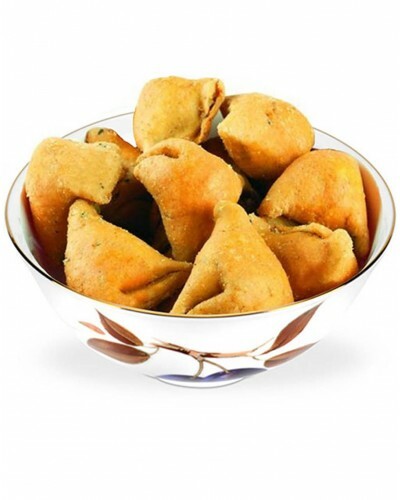 A spicy and crispy triangles stuffed with dry mixture of crushed gathiya & spices is a perfect light and tasty snack that can satisfy your urge for spicy and stomach-filling whenever you are hungry. This Mini Masala Samosa is stuffed with different roasted moong beans and spiced perfectly spices like black pepper, nutmeg, black salt etc brings about the excellent quality in taste and savour.